A while back I was introduced to an author, William Tolliver, in a Yahoo reading group who has a book out titled “The Mad Dog Connection”. It is a catchy title, but the group’s focus is centered on Arthurian fiction and I did not see how it could possibly relate to Arthuriana. It turns out that the story starts with a distant relative of the original King Arthur finding Arthurian relics in the Southwestern United States. The hero is drawn into a series of wild adventures and intrigues. It is a fun read and I recommend it, but the Mad Dog Connection aroused my curiosity. According to William, Mad Dog was a variation from the Welsh name Madoc. 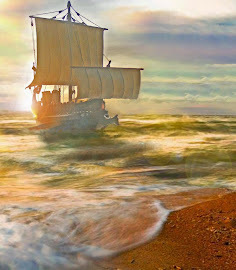 In Welsh folklore Madoc was a Welsh Prince who sailed to America in about 1170 AD, three hundred years before Columbus. The story goes that to flee the violent lifestyle of the times, he formed an expedition and sailed west looking for a more peaceful land. After finding a promising new land, he returned to Wales and recruited ten ships of colonists and sailed west never to be seen or heard from again. Madoc’s most likely landing place has been speculated to have been on Mobile Bay in Alabama with a settlement established in Fort Mountain, GA.
Where it gets interesting is that even though Madoc was never heard from again, tales of blue-eyed, fair skinned, Welsh speaking Indians abound. The explorer Captain Christopher Newport reported in 1608 that the Eastern Siouan and Mononcan spoke a language similar to Welsh. Algonquin Indians were aware of a tribe they called the “Mandoag” tribe, which is a pronunciation very close to Madoc or Mad Dog. Reverend Thomas Lloyd claimed to have been captured by Indians in 1669. He further claimed he conversed with the Indians in Welsh. Welsh speaking tribes were said to have been found near Louisville, Kentucky. One of Lewis and Clark’s assignments was to determine if the Mandan Indians in the Dakotas, which were said to have blue eyes and fair skin, could have been related to the Madoc expedition. 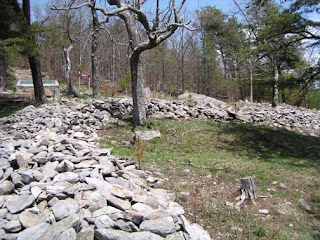 In Fort Mountain State Park in Georgia there is a stone wall that Cherokee Indian legend says was built by a “Moon-eyed, fair skinned” tribe called “Welsh.” Even a plaque has been erected in the park inferring that Madoc colonists may have built the wall. The legend was revived in the 1850’s when Zuni and Hopi Indians were said to have ties to Welsh settlers. The list of inferences and incidents is very extensive and are discussed in the Wikipedia and internet in much greater detail than I present here. Just type “Madoc” into the Bing search engine to find a myriad of sources. Sadly, all the legends and stories are labeled hearsay or anecdotal. None of the sources have historical teeth. Yet, the legend lives on. I guess I am a gullible, romantic and somehow find it easy to believe that a Welshman fed up with war and killing tried to escape to a more peaceful world. Whether you believe the Madoc legend was fact or fiction, William Tolliver’s “Fireblade” trilogy should not be missed. One critic has said the series is part edgy Mickey Spillane and part suspenseful Dan Brown. The series is action-adventure with historical overtones, all grounded in the present day and seen from the viewpoint of a very reluctant hero. The three books are titled The Mad Dog Connection, The Camelot Tapes, and Last Plane to Avalon. They are available from the publisher at www.publishamerica.com, or can be ordered by any bookstore. Professor Rhod Evans encounters deadly conflict when he finds that the supposed suicide of his best friend was actually murder. Pres Davies, his murdered friend, had refused to reveal to Lucius Valentine, a billionaire art pirate, where he had hidden King Arthur’s treasures, which he had found in America. Evans is forced to do battle with the same forces that overthrew Arthur in the sixth century. He finds allies in a priest, who is an expert with automatic weapons and a beautiful, enigmatic British lady. A man of peace must become a warrior, and more than that — he must find Arthur’s treasures before his enemy uses them to become the most dangerous man in the world.